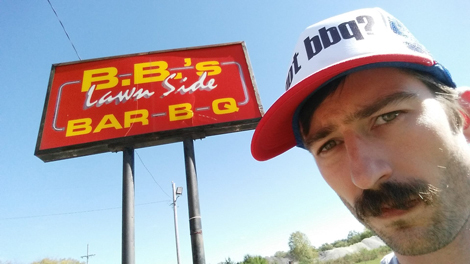 Doing the Lord's work: author Johnny Fuggit visited 365 restaurants across 48 states to scout ribs, brisket, pork, and other 'fixins. Reigning champ Matt Stonie’s eating feats are undeniably impressive. But if you’re more interested in spreading out your snacking over a period of time, follow the lead of Johnny Fugitt. The writer and barbecue enthusiast visited 365 barbecue restaurants across 48 states over the course of a year in an effort to find the true best 100 barbecue restaurants in America. Fugitt, whose book 100 Best Barbecue Restaurants in America was released this spring, was inspired to hit the road after seeing the same restaurants making the same lists over and over again. “It was the adventure of a lifetime.” Here he talks with us about the surprise victors, his favorite sides, and the power of barbecue to bring people together. On his motives for the quest. I wanted to know what the best barbecue restaurants in America were. I found all these lists…and I looked at them, and it was basically the same restaurants recycled over and over again. I’d been to a lot of them, and I thought that some of the famous places were good but a lot of them were overrated and not worth their reputation. I wanted to visit hundreds of barbecue restaurants in places like Oregon and Wisconsin and Vermont that don’t get the same kind of consideration, and I couldn’t believe no one had done something like this. It was the adventure of a lifetime. On service style and sides. I did notice a few stylistic service differences. Some [restaurants] are more market-style, like in Texas. There’s more table service in North Carolina. In Kansas City, it’s a lot of counter service. Every place has their own sides they put with barbecue. Kansas City has fries everywhere, but most barbecue restaurants don’t even have deep fryers. Sides really vary by region. In South Florida, they served alligator and fried plantains. In some parts of Texas, there was more Hispanic influence with the beans and rubs. A restaurant in DC had Old Bay seasoning in their rub. A thing you’ll see with some barbecue [restaurants] is that they’ve become somewhat homogenized. They’ll offer Texas brisket and Carolina pulled pork, but a lot of those places end up not doing anything extremely well. Places are better off to focus on one style or product. On disappointments and the NYC scene. There were a fair number of famous names that I left off my list. I heard that Dinosaur BBQ was going to be great, and some good people vouched for it. It was good for the Northeast, but it didn’t compare to a lot of places even in New York. My number two favorite on the list is Hometown Barbecue in Brooklyn. I think it’s phenomenal. I spent more money in places like New York and Philadelphia than I did in traditional barbecue areas or the middle of the country. In [North] Carolina, you can get a meal that’s $5 or $6, but in New York or D.C., you’ll get a side for that much. On funeral homes and food. I tell some strange stories in the book. Dreamland Barbecue in Alabama is very famous, and I really liked it. The story goes, though, that the gentleman who started it was trying to decide whether he was going to open a restaurant or start a mortuary. He prayed to God one night, and he had a dream that he should open a restaurant, and that’s how the restaurant came to be. I got to talk with a lot of pitmasters, and I’m very proud of that. On barbecue as an equalizer. I think barbecue is a great equalizer. In the parking lot at these places, you’ll see CEOs who get out in suits and ties parked next to people who have been working hard outside with their hands all day. They go to the same place, get the same food, and the same service. I think that’s really neat about barbecue. It varies region to region, and also has different cultures in different places. Even though we might disagree which styles are the best, everyone can be in the conversation. On the best of the best. Franklin is great, but I named another place in Austin as the best overall in my book. The brisket is what edged it out. It’s called Kerlin Barbecue, and it just barely nudged out Franklin. Overall, Hometown is number two. For pulled pork, I have Payne’s BBQ in Memphis as the best, then Skylight Inn in Lexington, NC as number two. Number four is Pody’s Barbecue in Pecos, Texas, and that one is kind of a surprise. On threats to barbecue culture. One thing a lot of restaurant owners talk to me about is the hike in their meat prices, and that’s pinched some of their margins. The numbers have gone up something like 50% over the last three years for brisket. I think that’s definitely a threat. 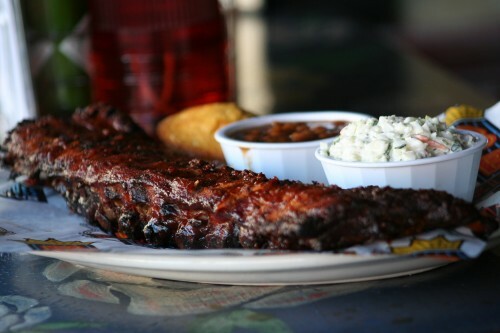 The increased popularity for barbecue means demand has been raised as supply has been lowered. Owners are trying to figure out the balance between raising prices and cutting back on serving sizes. The health issue is also interesting. It’s probably not the healthiest thing you can eat, but I actually lost weight eating barbecue for a year. The charred meat and salt might not be the best, but you’re not eating a ton of sugar. 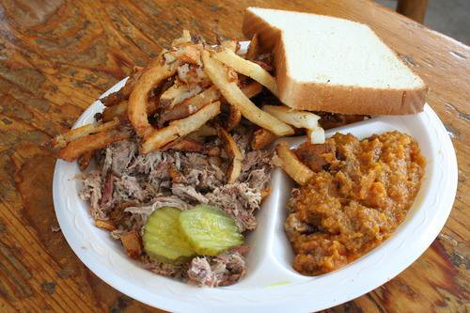 It’s easy to eat gluten-free, though, at barbecue spots. Overall, it’s just going to continue to grow. 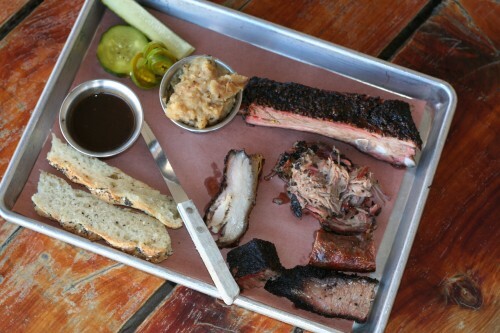 The future of barbecue is bright.